As we meandered along the gravel road leading to Hammonds Farm B&B, I knew that the Prince and I had made the right choice staying there. An alpaca farm in the Cotswolds! What could be better than that?! When we initially planned our trip through the Cotswolds, we wanted to stay on the east side of the Cotswolds the first night. Between a 6 am flight from Hamburg to London Stansted and then having to drive a few hours, staying in Stroud (on the west side of the Cotswolds) seemed a bit ambitious. However, after booking a bit late and having very few options, I stumbled across Hammonds Farm B&B. It had just opened a month prior and looked absolutely idyllic – gorgeous views, inviting rooms, a farm onsite, and a delicious homemade breakfast. We were sold! Let’s be honest, I was totally sold on Hammonds Farm B&B due to it being an alpaca farm. The best part? I don’t even like animals (please don’t judge me!). Neither the Prince nor I were raised with pets and due to our lifestyle, I never see us wanting one (I’m also a clean freak and would probably have a meltdown with a pet in our apartment). One look at the alpacas though and I told the Prince we needed to own an alpaca farm! Pure happiness right there. The alpaca I’m holding was only 3 days old! When we started going down towards the alpacas, I gave my camera to the Prince and told him to just keep snapping pictures! The B&B is owned by the sweetest couple, Bea and Harry. Bea’s father, Ben, runs the farm and went over-the-top to show us all the alpacas and explain fun alpaca facts to us. Did you know that alpacas like to travel in groups and hate being alone – just like teenagers?! But actually, you can’t get just one alpaca. Also, two white alpacas could randomly produce a black alpaca and vice versa. While the fleece of the parents usually determine the fleece of the baby alpaca, it isn’t 100%. Ben showed us some examples with three generations with white fleece and then boom! A random baby alpaca was born with black fleece. The Prince told me I just kept asking Ben alpaca questions – I couldn’t get enough of it! I think in total Hammonds Farm has around 100 alpacas. They also have several sheep on the property. And, contrary to belief, alpacas don’t normally spit! They spit if threatened but it is really unlikely that they’ll spit. Honestly, I probably liked alpacas so much because they don’t naturally come up to humans (I hate when dogs come up to me and start licking me). They were just the sweetest animal with the softest fleece ever! I promise these are the last of the alpaca pictures but guys, how adorable are they?! Seriously, just looking at these pictures makes me want to own one! While the alpacas were definitely a highlight for me, I can’t neglect the actual B&B itself. I told the Prince that this might just be one of the best places I’ve ever stayed at in my life! Everything about it was wonderful – such friendly owners, the most delicious breakfast (the Prince and I didn’t eat again until dinner time! ), the softest/plushiest bed, cookies in our room (sorry Prince, I ate all of them and hid them from you! ), and readily available tea and coffee. I think the best part was the stillness and relaxation. We both fell asleep around 9 pm and didn’t wake up the next morning until 9 am. We’re already planning our next trip back in 2018! This was the scenic view from our room’s window. I mean, how quintessential British is this entire scene?! I can’t thank Bea, Harry, or Ben enough for the warm, welcoming, and over-the-top experience we had at Hammonds Farm B&B. I should note – nothing about this stay was sponsored. I just loved it THAT MUCH that I wanted to share it with all of you, especially because the B&B just opened in July. If you’re going through the Cotswolds, make sure you plan a night here! For dinner, I’d highly recommend Stroud Brewery. The beer is delicious and the pizzas are all made in the pizza oven (I legit saw a guy chopping wood next to the oven to keep it going). The locals are so overly friendly and I think the Prince and I knew half the town before we left! I love this place!! The alpacas are so cute. Little fuzzy babies…I want to hold one! And by the way, I am so with you on the dog thing…I believe we will have a dog in our future, but I never had one growing up and can’t stand how stranger dogs will run up and try to jump on you. It’s just a little overwhelming when you don’t have lots of dog experience. I LOVE Alpacas!! I visited a farm in New Mexico a few years ago then met my boyfriend, whose last name is Llamas. Can’t be a coincidence, right? This looks amazing!! I just want to run through a field of fluffy alpacas (maybe not quite but definitely want to cuddle loads of them). 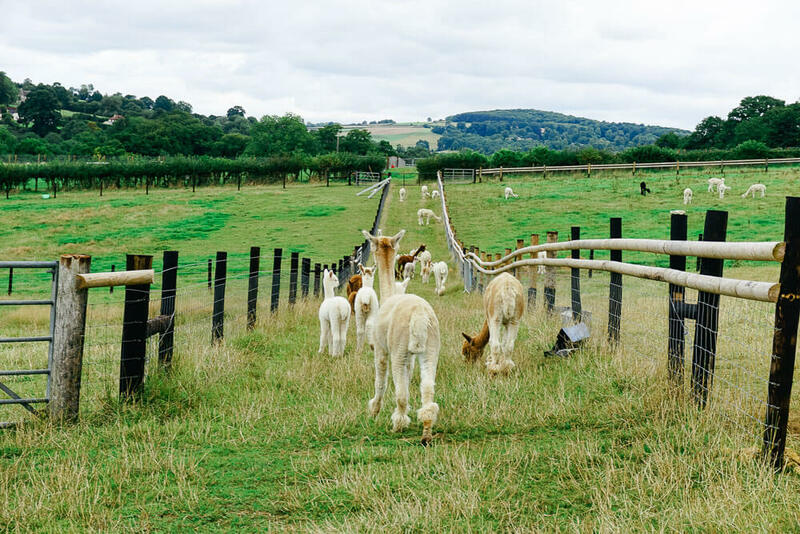 Kind of makes me want to visit the Cotswolds…because alpacas. THIS IS MY DREAM!!!!!! Genuinely just looked up when I could go stay haha. It looks like they close for the season in October though which is a huge bummer :( I definitely would want to stay next year! STOP IT WHAT IS THIS, ACTUAL LITERAL HEAVEN?!?!!?!??! My friends and I have joked for YEARS that we want to own an alpaca farm. THIS IS IT. THIS IS OUR HEAVEN. We’re going and I’m going to frolic through the alpacas and hug them ALL and befriend EVERY SINGLE ONE of those fuzzy little fluff muffins! AHHHH!!!! How freaking cute are they?! I’m. It much an animal person either but I always bad telling people with dogs that.